Save time and book tee times in California with GolfSmash. Find the best golf course and even get discounted California tee times today! We are working diligently with golf courses and affiliates to bring you the best deals around. From twilight specials to ladies specials, we will work closely with golf courses to bring hot deals to you. We let golf courses market directly to you without a middle man or barter. 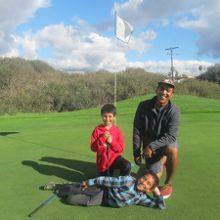 We let golf courses feel free to work with golfers to give them the best tee times in California. Didn't see your favorite course? Tell us the name and location and we'll work on getting them on GolfSmash as soon as possible.